Good News: 'Great Progress' Reported In Fighting Colorado Springs Fire : The Two-Way The blaze is still far from contained, but officials feel as if they're making gains. And the weather is cooperating today. Temperatures are cooler and winds are calmer. Smoke was rising earlier today from the Waldo Canyon wildfire that's threatening Colorado Springs, Colo.
Our day began with talk of "hell in the review mirror" when a reporter from The Gazette in Colorado Springs fled his home earlier this week as the Waldo Canyon wildfire approached. 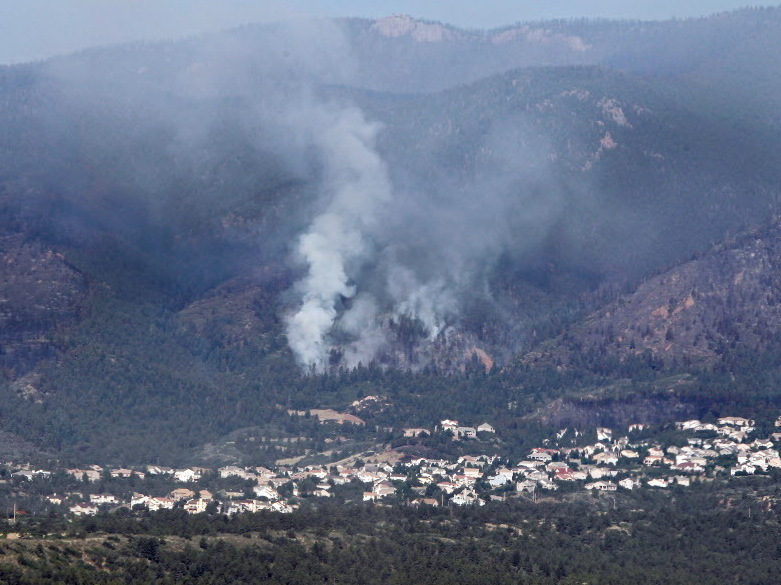 "Colorado Springs Mayor Steve Bach and other officials smiled many times during a media briefing Thursday morning, and said there was good reason to hope that the Waldo Canyon fire was on its way out the door." Incident commander Rich Harvey told reporters that while the blaze remains only 5 percent contained, firefighters made "great progress yesterday," the Gazette adds. And NPR's Jeff Brady tells our Newscast Desk that today, "cooler weather and calmer winds are helping crews fighting the fire," which has now burned more than 18,000 acres on the western side of the city. Still, as The Associated Press reports, "Colorado Springs officials [also] said Thursday that hundreds of homes have been destroyed." The Denver Post reports that Mayor Steve Bach said "346 homes on 34 streets have been destroyed by the Waldo Canyon Fire." About 32,000 people are still displaced.